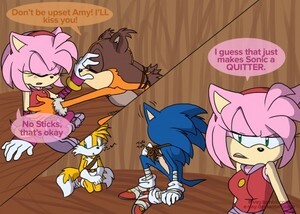 Sonic can't Kiss Amy. . Wallpaper and background images in the Nhím Sonic club tagged: photo. This is a fan comic... They are playing a game... Sonic in the game, has to kiss player two(That is Amy), but doesn't... After Amy says this, Sonic, what of the blue kisses Amy, and runs away after... SONAMY!